The Weekly Beings Diary is a weekly calendar with a particular sketch, the “weekly being” in each week, waiting for you to draw over it and to create your own artwork. Every year with 53 new sketches, limited edition of 200 numbered copies. The diary size is 15,5 x 11 cm, screen printing on fabric. Draw your week, imagine, crate, enjoy. 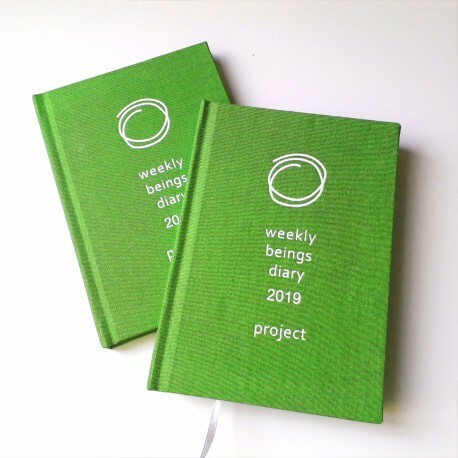 Weekly Beings Diary presents an alternative way to remember the year, by drawing the mood of your week. Planning on the sketch, depending on your mood, primarily using your imagination and with pencils, pens, making collages and everything else clauses, the sketch is transformed into something unique. At the end of the year, the annual group exhibition is organized by the "weekly being" holders. Visit them at www.weeklybeings.eu and at their facebook page.